Greg Rusedski's former coach says he is certain the British star is innocent of the doping charges laid against him. 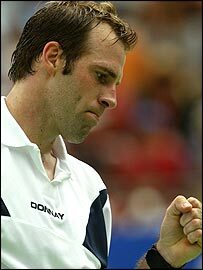 Brad Langevard told BBC Sport that Rusedski was a "perfectionist" who would never take a banned substance deliberately. "Of all the men and women on the circuit, Greg would be the last person I would suspect of doing anything like that intentionally," Langevard said. "Maybe he's done something stupid, but it would be completely out of character. "I've got no reason not to believe Greg from my past experience." Langevard, who coached Rusedski for 11 months in 2001, said he had never worked with anyone so careful about what they put in their body. "He is so fastidious, so precise. He's not the slightest bit careless or sloppy," he said. "I never saw him mixing up any protein powders or anything like that, and I was with him around the clock. He never even used to take painkillers. "I spent a lot of time with him in hotel rooms, and he used to amaze me. "He would have all his clothes folded up, he'd have all his vitamins stacked up, always exactly in the same place in the same part of the table. He was almost a freak in that respect. "He was on a strict diet, and he stuck to that whenever he could. "He would go through the food on menus in restaurants and at tournaments and carefully select what he was supposed to be eating. "He is such a disciplined guy, so dedicated. He always spoke out against anyone taking anything. "That's the kind of guy he is. One of the things that makes him hard for some people to deal with is that he is a perfectionist - he can't stand to get things wrong. "He had his nutrition down to a 't' - he wouldn't even have a glass of wine." Langevard believes that Rusedski had less reason than almost any other player to take an illegal drug. "I can't imagine Greg trawling through the internet trying to find some nandrolone," he said. "What's the point? The guy's probably the best athlete on the circuit. He's already got the ideal build and strength, and he has aggression coming out of his ears. "The only explanation is either that Greg has done something silly late in his career and decided it will help him, or somehow it's accidentally been given to him in a very small quantity. "With the injuries he's had recently, maybe someone has given him something to get through a match. "But my gut feeling, knowing Greg, I would definitely give him the benefit of the doubt and say that somehow it's been passed on to him indirectly." What now for the ATP?